NEWPORT NEWS, Va., July 1, 2014 (GLOBE NEWSWIRE) -- Huntington Ingalls Industries' (NYSE:HII) Newport News Shipbuilding division has successfully completed anchor testing on the aircraft carrier Gerald R. Ford (CVN 78), bringing the ship closer to its 2016 delivery to the U.S. Navy. Ford's new anchor system features a lighter anchor and chain, weighing in at half the weight of the previous Nimitz-class carriers' anchor systems. Ford features new technological and design innovations in several systems, including the anchor handling system. At 30,000 pounds, Ford's anchor is significantly lighter than the Nimitz-class anchors, matching the overall lighter weight of the carrier itself. The anchor chain also weighs significantly less than its Nimitz counterpart. The 1,440-foot chain consists of links made of high-strength steel, each link weighing about 136 pounds. Newport News shipbuilders recently gathered to test Ford's anchor windlass system that is used to deploy and retrieve the anchor and chain. Load tests are performed by attaching additional weight to the anchor to simulate both a 180-foot drop and a 360-foot drop. The anchor handling system must be ready to deploy at a moment's notice in the event of an emergency. 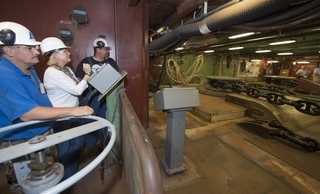 "It was through tremendous teamwork across multiple departments that the anchor windlass system was tested satisfactorily on Ford," said Derek Briggs, the foreman in charge of testing the new anchor's system. "By testing each system on the ship, we are able to demonstrate to our customer, the U.S. Navy, that the systems perform as designed. Testing on Ford's anchor windlass system was successful and is a testament to the quality and pride with which our shipbuilders perform their work each day." During a recent visit to the shipyard, ship's sponsor Susan Ford Bales tested out the anchor for herself. Accompanied by Geoff Hummel, director of general manufacturing for Ford, Bales was able to deploy and retrieve the anchor using the new electrically powered system, unique to Ford's design. In Nimitz-class carriers the anchor systems were hydraulically fueled.